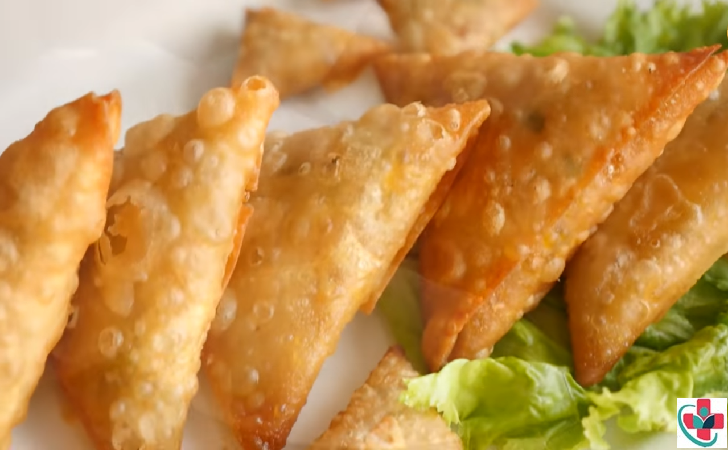 The best Kenyan beef samosa recipe consists of delicious meat filled in a pocket of crispy pastry. In this recipe, I show you how to make a quick beef filling and my special way of making the samosa wrappers as well. You can substitute the minced beef for mutton, minced chicken, cottage cheese or soy chunks. For the filling: Heat oil in a pan and add the meat. Use a wooden spoon to break it apart and let cook until the meat has turned brown. Add the garlic, ginger, green chilies, cumin powder, and salt and stir. Cook for 10 minutes. Turn off the flame and add onions, coriander leaves, and lemon juice. To make the dough: In a bowl, combine flour, salt, and water and knead for 10-12 minutes. To make the pastry watch the video above for step by step directions. Deep fry the samosas for 3-4 minutes or until golden brown.